Punecity.com, takes an insight at Pune's foremost English Film Screening Theatre - Alaka Theatre. Alaka is not merely a cinema hall and a landmark, it is a symbol of the cultural ethos of our very own Amchi Pune. The Theatre has borne testimony to the major happenings that have shaped the city and left behind a string of bittersweet memories. For instance, the theatre saw the ruinous floods of '61, it saw the hippies of the '70s, the commercialisation of the '80s and now witnesses globalisation of the present decade. Apart from screening movies, the theatre has chiseled a distinct niche of its own laced with love and caring. Alaka, has all along been the place to go for all-time great English films. The cinema hall has entertained generations of Puneites with some super Hollywood entertainers. Set at the crossroads, at the chowk formed by the Lakdi pool and the ever-busy Laxmi and Tilak Roads, Alaka Theatre was founded by the Late Bhaskarrao Vishnu Dharap. It started functioning on February 25, 1949 on the auspicious day of Maha Shivratri with the screening of "Chandralekha". Dharap, himself was a multi-faceted genius who was an engineer as also a film-maker. He also produced the Marathi film Dev Bappa that was a runaway hit. He was a well-known film historian and his first volume of Filmograph, Indian films 1972, is the most comprehensive book on Indian films. 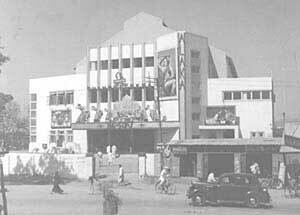 The construction of Alaka talkies started on April 18, 1947 and within two years the building was completed. Currently, the theatre is owned by B.V. Dharap's wife, Usha Dharap, and run by his daughter Meena Gondhalekar. The first ever film screened was a visual treat for moviegoers, as costume drama, it had Gemini and Vasan in the lead. Alaka, was unlike other cinema halls in the city which changed with time and projected popular Hindi and regional Marathi cinema. Alaka started screening the English matinees from April 10,1949 with "Song of Scherzade" and continues to do so till date. The screening of regular English films started with Three Musketeers. A number of slapstick jubilee hits by actor Director Dada Kondke also had a successful run here. Most of the James Bond films have celebrated jubilee runs at Alaka as well. "Titanic" which ran to packed houses and created history in the country was also screened here. It was with Titanic, that the hall got the Dolby Digital Sound System. Alaka can accommodate 246 people in the balcony and 617 in the stalls. It is the only theatre that charges a moderate Rs 25 for balcony and Rs 20 for the stalls and accepts booking over the phone as well. Alaka was initially meant for staging prestigious Marathi stage shows. Some of the prominent ones, which were staged here, include Hirabai Barodekar's musical recital on the 11th death anniversary of Late Deenanath Mangeshkar. The hall also saw the legendary Lata Mangeshkar paying a tribute to her late father. Other than these, Rohini Bhate's Kathak recitals, one act performances by Suhasini Mulgaonkar, and memorable performances by Pu La Deshpande were also held at the hall. Alaka talkies had its own share of problems too. The first one came up in 1958 with the management staff striking against the owner, V.B. Dharap who opted to close down the establishment for about a year until the staff gave in. The second calamity struck in 1951 when the devastating floods of Panshet wrecked the cinema hall, but luckily it was able to withstand the floods because of its solid construction. One of the most comical coincidences during the floods was that the film "Some Like It Hot" was being screened then which had the legendary Marlin Monroe in the lead. Gondhalekar, Dharap's son-in-law, recalls the swirling flood waters having reached up to the point where Marlin Monroe's skirt had parted in the posters. Another incident that Gondhalekar recalls has to do with his father-in-law's perfectionism. On his routine visit to the theatre just before the day he passed away, Dharap noted the words "cigarette tray" was spelt wrongly, which he pointed out to Mr. Joglekar the manager. The Gondhalekars have renovated the theatre by changing the screen size, as also the acoustics, improving cinema projection, planning bookings on the Internet and extended parking facilities. Fifty years on, Alaka theatre still happens to be a major force to reckon with in the discerning city's cultural arena. Titanic- 30 Weeks, First English Film to celebrate Silver Jubilee Run in Pune. Baby's Day Out- 9 Weeks. Dada Kondke's - Pandu Hawaldar- 36 Weeks. Hyoch Navara Pahije - 25 weeks. Bot Laween Tithe Gudguliya- 25 weeks. Sawat Majhi Ladki- 15 weeks.